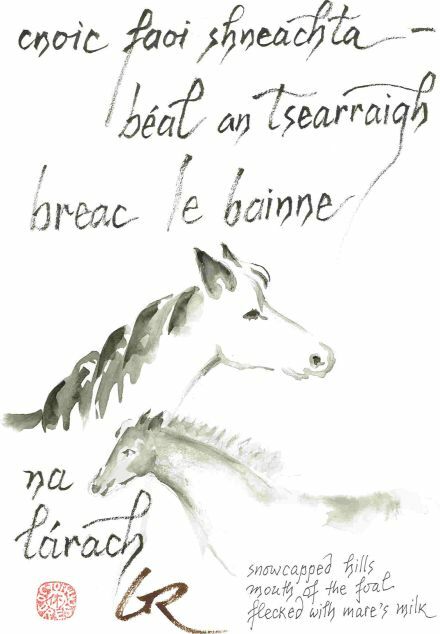 Gabriel Rosenstock is a poet and haikuist, author/translator of more than 150 books, mostly in Irish (Gaelic). Recent titles in English published in 2009 include a volume of poems from Salmon Poetry, Uttering Her Name, devotional poems to a muse-goddess which the author describes as ‘ecstatic utterances in a neo-bhakti style’ and two contemplative books on haiku as a way of life from Cambridge Scholars Publishing, UK, Haiku Enlightenment and Haiku the Gentle Art of Disappearing. A five day old embryo. But you have not yet arrived into this world. A secret you will never share with me. I see you as a colour, a blob, a shape. That’s all. What do you see? Do you know what pain is? Pleasure? Anything at all? A squeak? You have three hearts. Three hearts. How can you stand it? Ach níl tú tagtha fós ar an saol. Rún nach roinnfear liom go brách. Mar dhath, mar mheall, mar chruth a fheicimse thú. Sin uile. Cad is léir duitse? An eol duit cad is pian ann? Pléisiúr? An gcloiseann tú aon ní? Trí chroí atá ionat. Trí chroí. Conas a sheasann tú é!